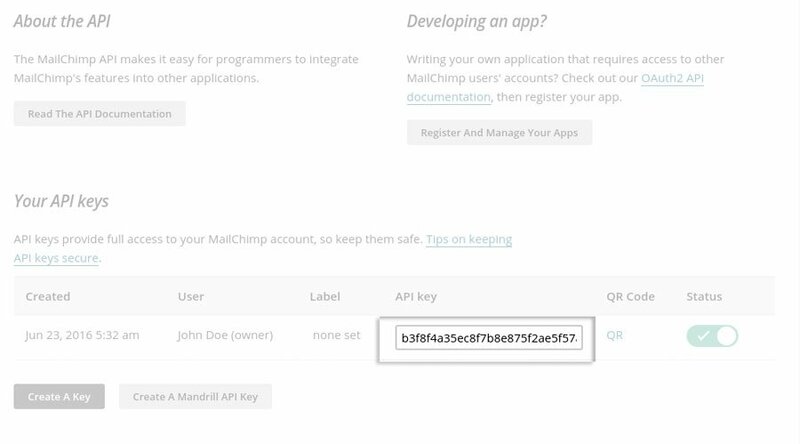 Now go to http://admin.mailchimp.com/account/api/ and create a new API key with the related button, as you can see below. 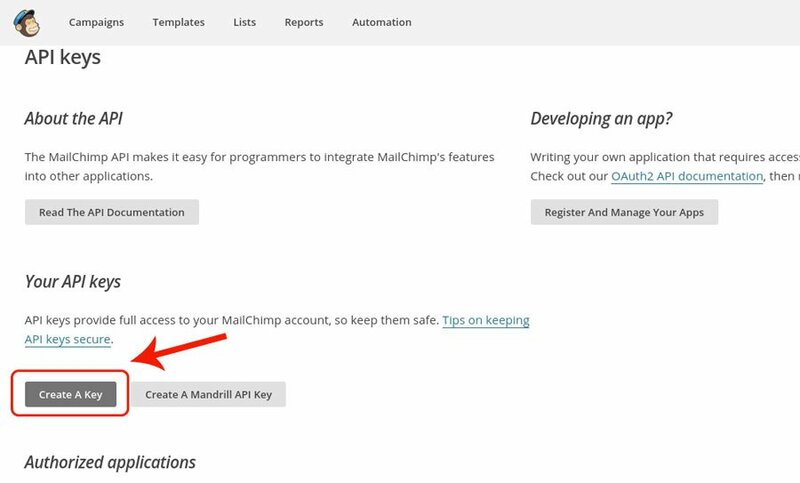 After creating it, copy and paste the key in the “MailChimp API Key” field that you find in the plugin settings dashboard. 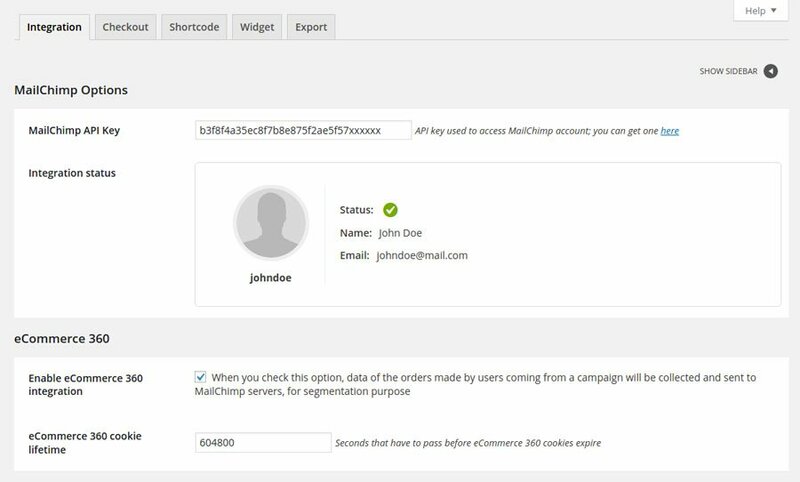 If no mistakes were made, validation will be done correctly and you will see the information about the linked MailChimp account. 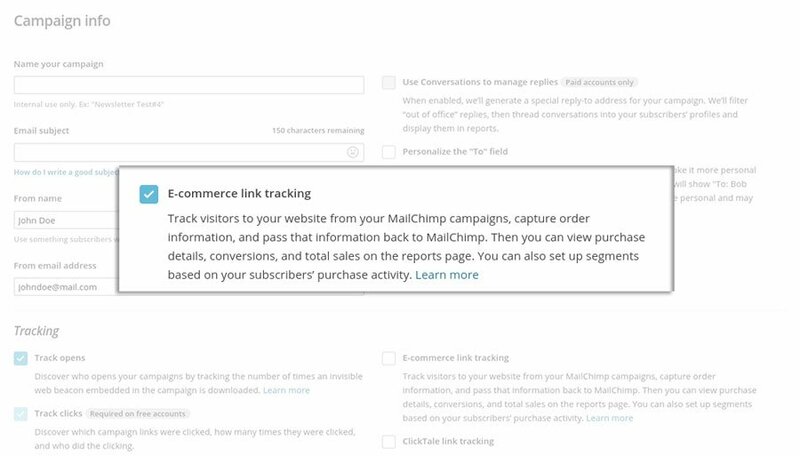 This option allows you to enable a specific type of system able to track purchases derived from a campaign (Discover MailChimp campaigns). 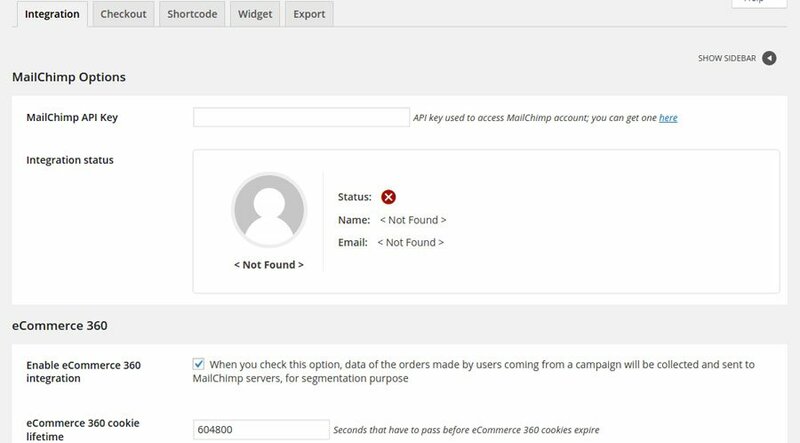 It is essential that during the campaign creation the option eCommerce 360 link tracking is enabled. 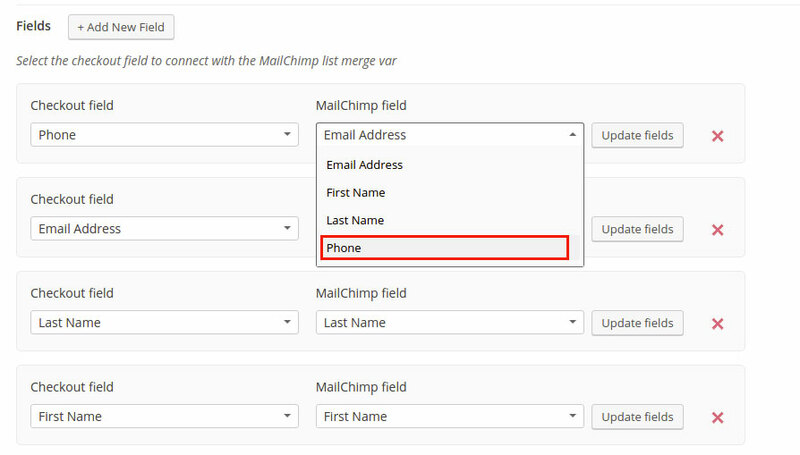 If these settings have been enabled, both in the plugin and in MailChimp, MailChimp will “append” the data “mc_cid” and “mc_eid” to the email that will be generated. 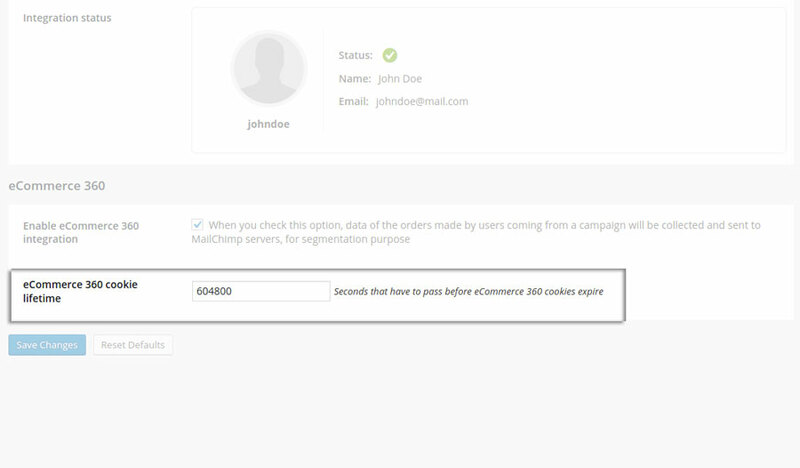 As soon as the user clicks on the link in the email, the shop stores data in a cookie and keeps them until checkout, for a maxixum time lapse set in the specific plugin option called “eCommerce 360 cookie lifetime”. 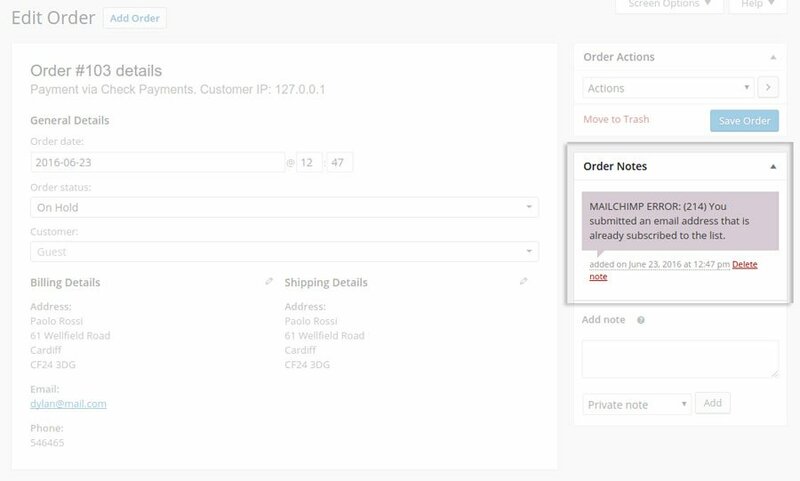 If the user goes to checkout, the order will be tracked for the user that received that specific information. 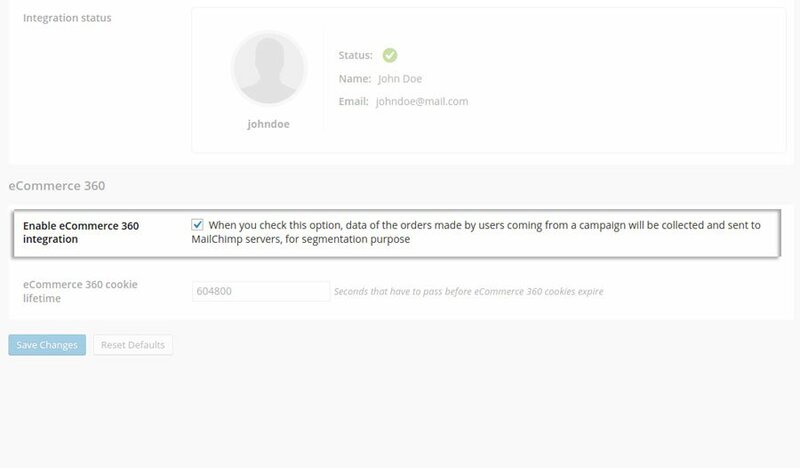 Now your MailChimp page should be populated as you can see above, depending on the orders made by users coming from that campaign. N.B. Order registration will be done as soon as it is placed or completed according to what you have specified in the option “Register after” available in the tab “Checkout”. 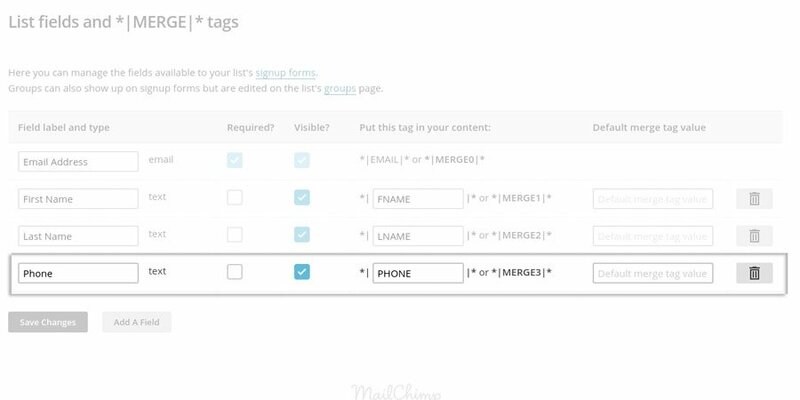 In order to have a smart registration to your MailChimp lists you can insert an unlimited number of conditions that will be checked during the purchase. Users will be registered to the lists and/or interest groups only if all the conditions will be satisfied. 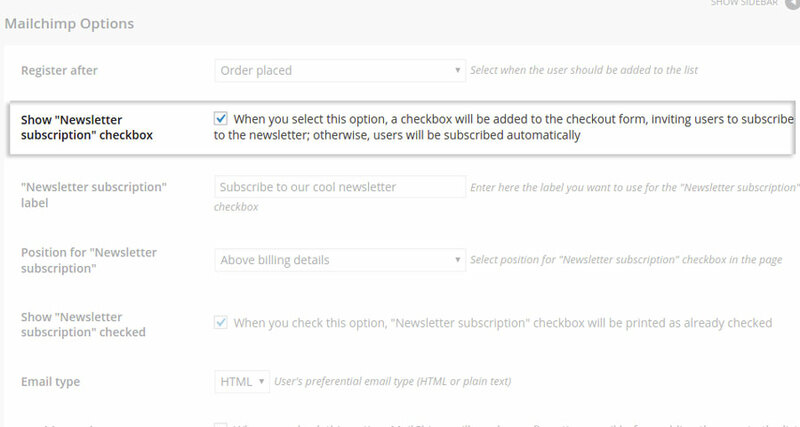 You can also check the value of a specific checkout field. In order to spot the field, you need to specify the value of “name” attribute (the value that will be sent to the $_POST variable at the checkout). The data can be easily recovered by opening the browser console and selecting the specific field. 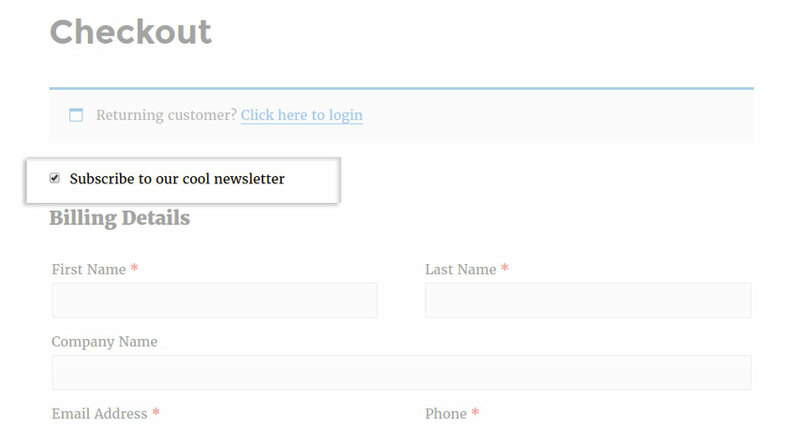 Here is an example: we would like to check that the email field doesn’t include the word “yopmail”. 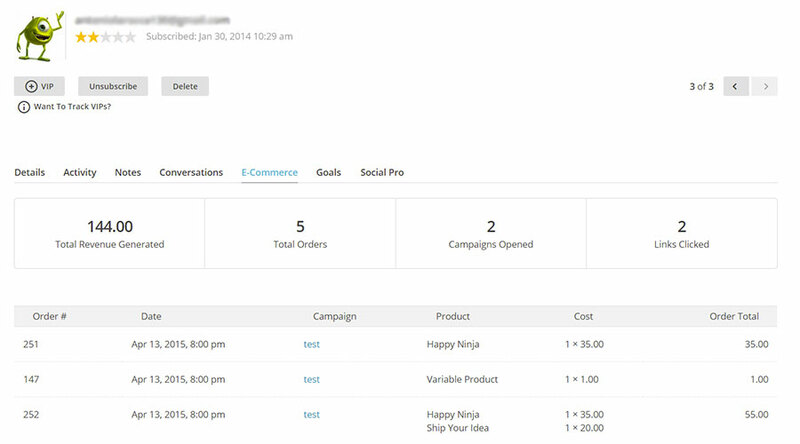 We recover the value of “name” attribute in the email field. Now we insert our condition and save the options set. 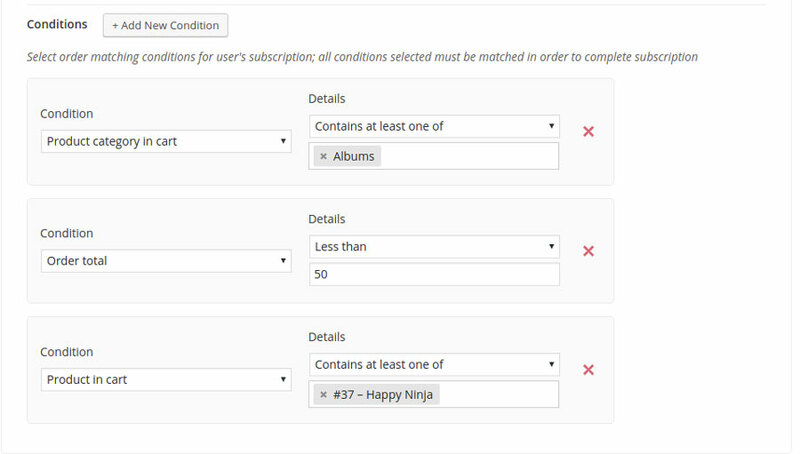 The premium version of the plugin supports the possibility to subscribe the user to one or more interest groups available on the selected list. After selecting the list, the system will upload the updated list of the associated interest groups (if available) in an automatic way. 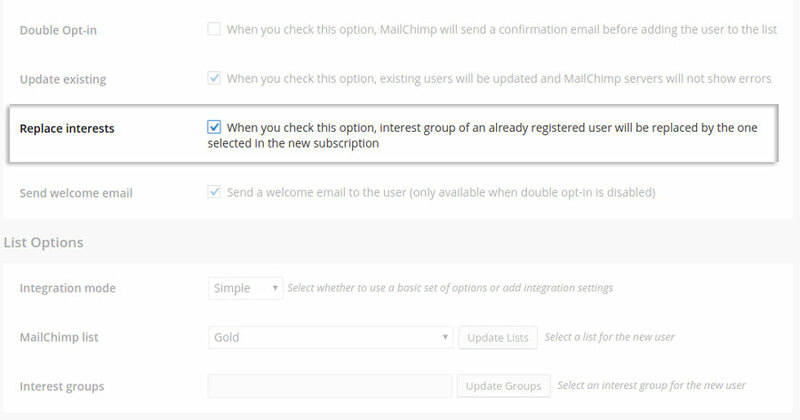 If you have created a new group on MailChimp and you want to select it within the plugin, you won’t need to refresh the page. Click on “Update groups” button and the list will be updated automatically. 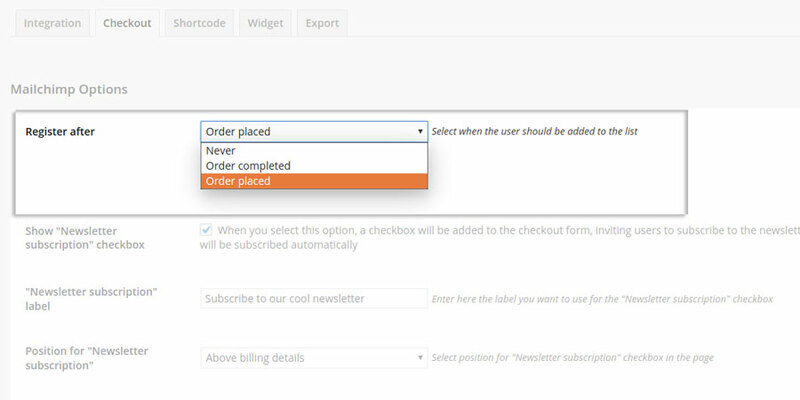 When an already subscribed user comes back to purchase on your shop, no action will take place on MailChimp list and you will get an error within the order which notifies that user has been previously subscribed. The control will be applied in the email field. 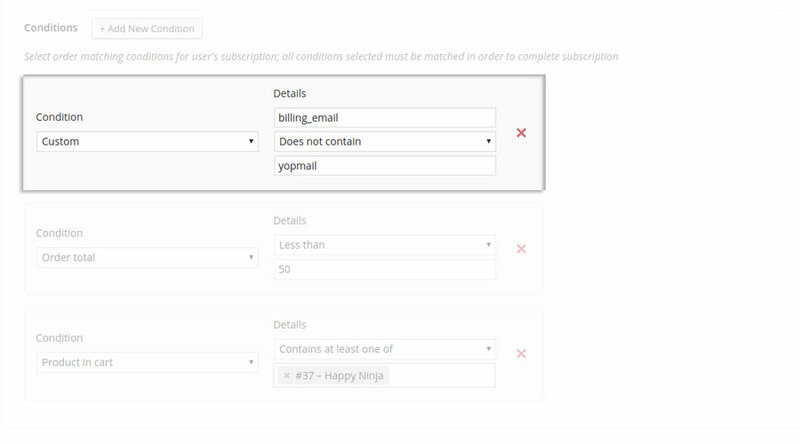 The error doesn’t happen if the subscription list has changed compared with the previous purchase. 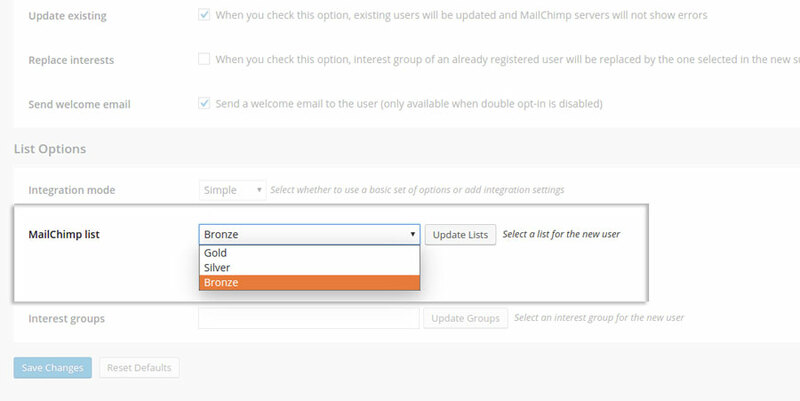 However, in order to avoid the above mentioned MailChimp error, youcan enable the “Update existing” option. This way the subscribed user’s profile will also be updated automatically in case he inserted a different name/last name, compared to the last purchase. 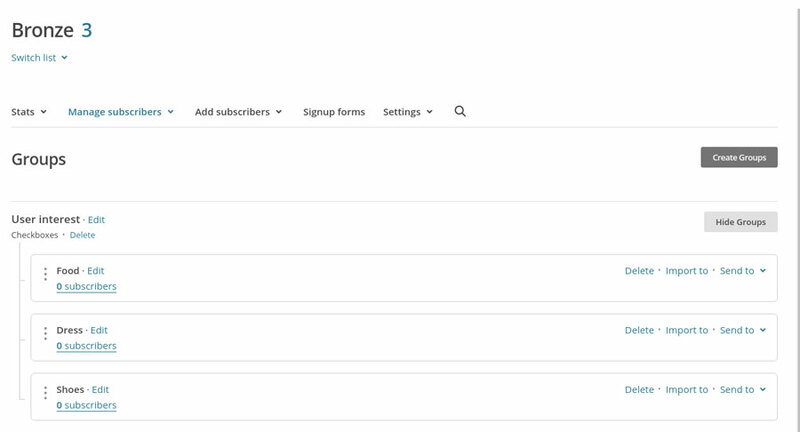 The option allows you to edit the default behaviour of the plugin when a user that is already registered to a list and to interest groups tries to register once again, by updating his/her own profile (for this action to be successful, the option “Update Existing” has to be enabled). 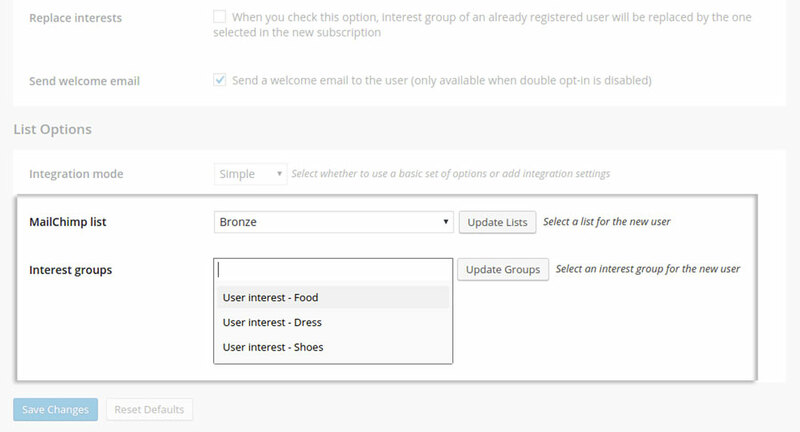 Default behaviour both keeps users registered to interest groups in which they were and adds them to the new ones. On the contrary, if the option Replace interests is enabled and users update their profile, they are added only to new interest groups and are removed from previous ones.